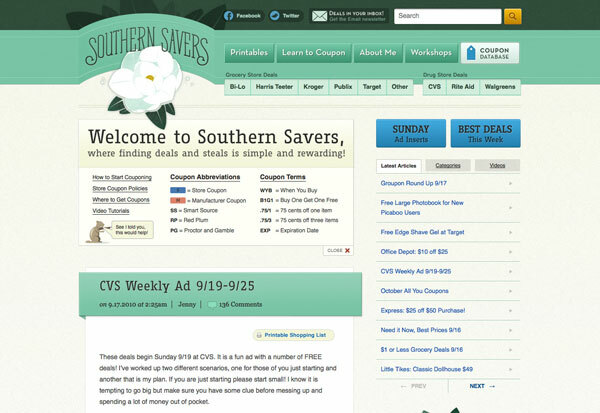 When we last checked in on the Southern Savers redesign project, all the pieces of Jennyâ€™s site were collated, just begging to be assembled into a fresh new design. Emily Smith laid the groundwork with her usability research, information architecture, and wireframes. Next, Andrew Ramos presented mood boards to Jenny to gain an idea of what colors and texture she favored for the new and improved Southern Savers branding. It was at this stage of the game that Matthew Smith, Squared Eyeâ€™s creative director and principal, stepped up to the plate to knock out the website design. Working from Andrewâ€™s branding elements, his first order of business was choosing typography. â€œWhen working from a brand,â€� said Matthew, â€œI try to maintain its authentic nature, but interpret it through a web lens.â€� Part of that interpretation involved finding a typeface that paired well with the unique hand-lettered, arched type in the new logo. After browsing through his options, Matthew finally settled on the slab serif face Fago Office Serif. Considering that the logo type is a hybrid of a slab serif and a script, this option fitted the look of the branding while still providing enough contrast to stand out on its own. For the body copy, Matthew wanted a simple out-of-the-way typeface that would let the Fago headlines stand out rather than compete with them. Helvetica was the best option, he decided, making the default font stack simply: Helvetica, Arial, sans-serif. The figure below shows how the new logo looks paired with Fago Office Serif and Helvetica body copy. With the typography selection nailed down, there were still some color and texture decisions required to flesh out the wireframes. Matthew decided to use the flower portion of the identity as his inspiration here. â€œThereâ€™s some really nice texture happening in those petals that feels elegant but earthy, and I wanted to bring that through the rest of the site.â€� Drawing from that illustrative style, Matthew incorporated a teal ribbon for the header area that arched out of the page geometrically to give emphasis to the logo. Above that ribbon, he used the dark green from the color palette, accented with copies of the magnoliaâ€™s leaves. These elements provided a visual container for the siteâ€™s navigation elements that were defined in Emilyâ€™s wireframes. As Matthew was continuing with the design comps, Kevin Smith, the projectâ€™s development kung fu expert, was starting on the front-end development and WordPress integration. It was Kevinâ€™s job to determine just how all these typography decisions would get baked into the siteâ€™s build. He knew he had to use a dynamic font replacement technique, so he decided to go with Cufo?n for most instances of the headline font, and image replacement for some of the buttons and static items. 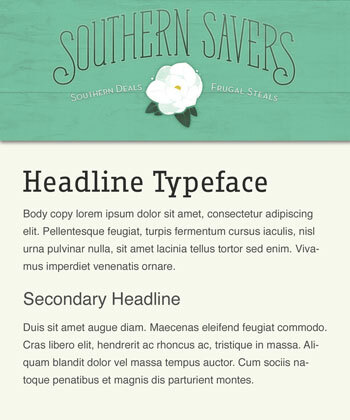 The screenshot below shows how these typefaces, as well as Matthewâ€™s header design elements, ended up looking in the finished site. In the final installment, we’ll be looking at the last piece of design for the Web: imagery. Stay tuned! This is the second in a five-part case study drawn from SitePoint’s The Principles of Beautiful Web Design, 2nd edition. The book covers all the principles of graphic design as they pertain to the Web, and it’s presented in a way that’s easy for non-designers to digest.